Ben: Our story actually revolves around music. We first met eight years ago at NUS CAC Voices, a Mandopop performing club of the National University of Singapore. Celine was one year my junior and I was on the judging panel during her audition. Celine’s first impression of me was not ideal. In fact, due to my stern expressions and comments on her vocals, she had thought of me as arrogant and rude. However, I thought of her like a breath of fresh air and a sweet-looking girl who could sing pretty well. As performers for subsequent concerts, our interaction increased and she eventually changed her impression of me. It was also then that I felt that she was the one, so I looked for the chance to ask her out. I had no prior dating experience (she was my first love) and was very grateful that two Taiwanese singers we both liked had launched their new albums. This gave me the perfect excuse to ask her out – to purchase their albums together. Following several dates, we became official after I confessed to her during a music showcase of one of the singers. Ben: In addition to music, our common interests also include travelling. Hence, for the proposal, I decided to incorporate both interests. This happened during our trip to New Zealand – the perfect place for a proposal! I chose Lake Pukaki for its stunning milky colour and the majestic Mount Cook in the backdrop. Despite that, it was not easy finding the right spot along the lake to pop the question. As Celine is not a fan of public proposals, the standard tourist photo spots were definitely a no-go. the tripod and told her that we were about to take a picture together. (In actual fact, I was preparing to record the proposal.) I took out my phone to play a song that I had composed for her prior and popped the question after that. a specific style in mind. My only requirements were that the cut of the gown should flatter my body shape and that it should not be challenging to walk in. As these requirements were quite broad, my bridal studio played a huge part in helping me select gowns that best suit my petite frame and body shape. My first gown was a ballgown with an illusion bodice from the White One collection by Pronovias, a wedding gown line that is exclusively carried by the Thomson Wedding Collection. 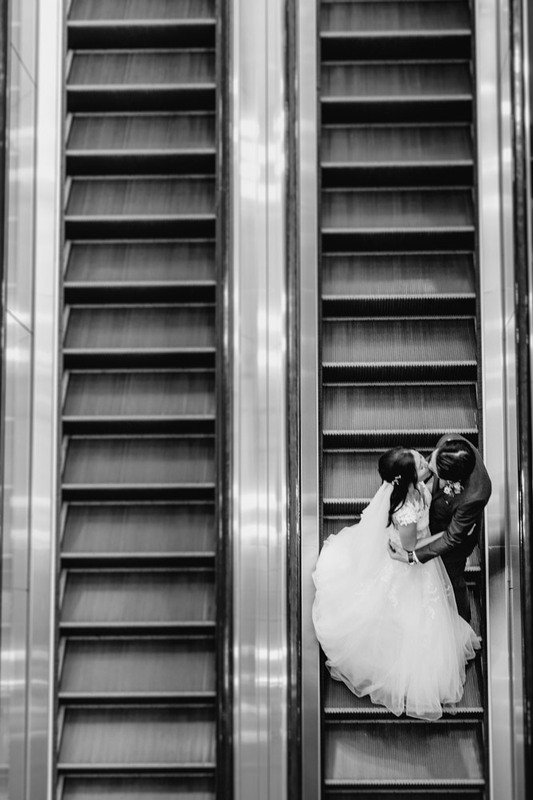 Despite the voluminous tulle skirt, the dress was surprisingly lightweight and relatively easy to walk in! As a Disney fan, the ballgown’s silhouette and dreamy vibes were very appealing. For my second gown, I opted for another white gown. I also wanted to make a bold statement and make a departure from my usual good-girl image. 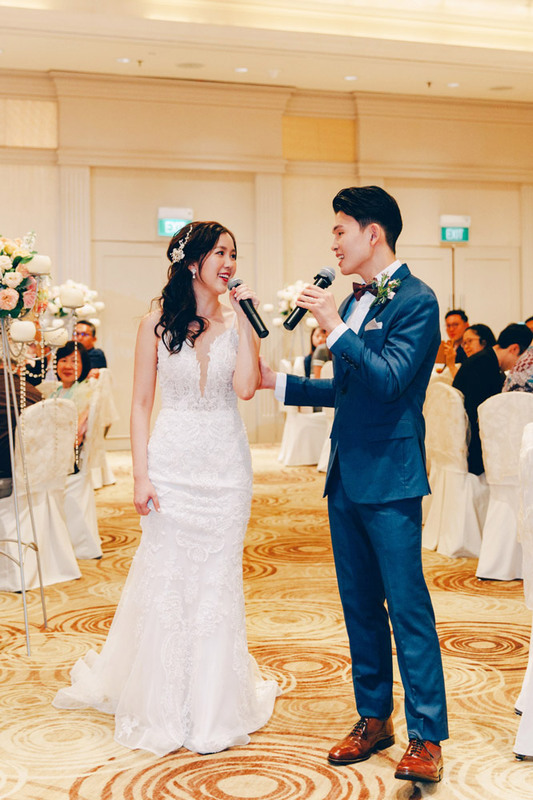 As such, I chose a mermaid lace dress with a plunging neckline and illusion back details, a gown that was relatively easy to walk in during the banquet. Ben: I wanted something simple for my suits. To me, details such as the cutting, material, and colour make or break a suit. As such, I decided to have my main wedding suit tailored. 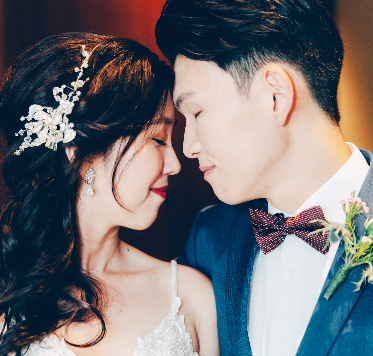 For my other suit, I was glad that the Thomson Wedding Collection had something classy in black for me, to fulfil Celine’s desire for a Korean- style wedding. 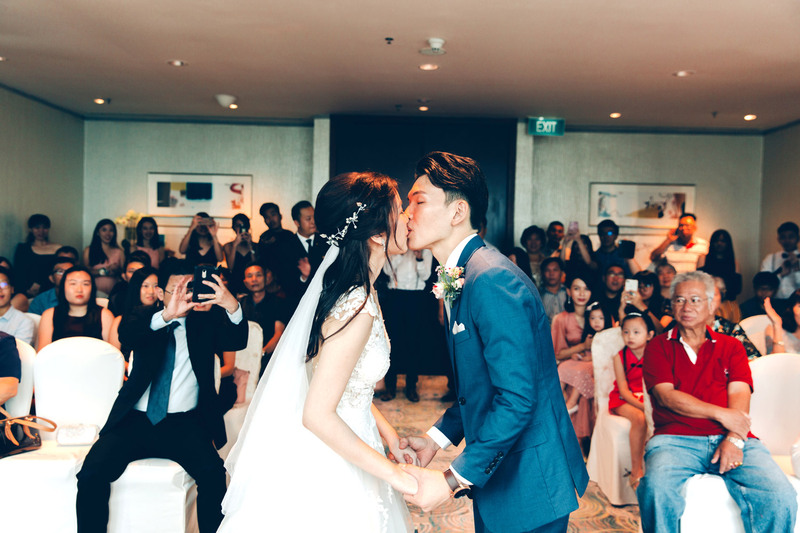 Ben: We did not have specific venues in mind and started off by researching on almost every hotel in Singapore online by looking through their photos, estimated costs and customer reviews. However, we did have a few criteria. For instance, the ballroom had to be pillar-less with a moderately high ceiling, the price range should be within our budget, and last but not least (as Celine and I are foodies), the food has to be tasty. We eventually decided on Mandarin Oriental to hold our wedding. We read many positive reviews on the food, both online and from our friends and family members who have tried them. To us, it is important that our guests enjoy the food. We were glad that they did, with them giving raving reviews for dishes including the codfish, mantou with chilli crabmeat sauce and cakes. Celine: Apart from food, the pillar- less Oriental Ballroom, with its pretty chandeliers and long march-in aisle, was much to our liking. The fan-shaped ballroom also allowed for guests sitting at the corners to see the stage rather clearly. 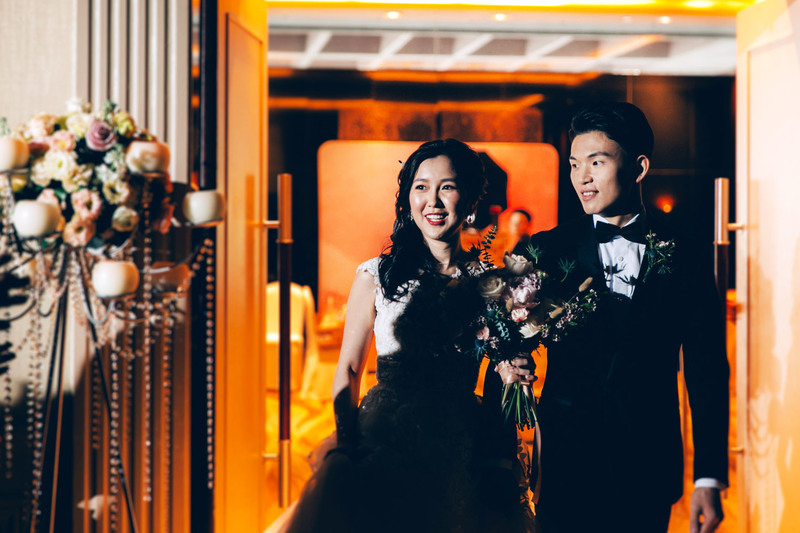 Mandarin Oriental also offered the options of customisable wedding themes. 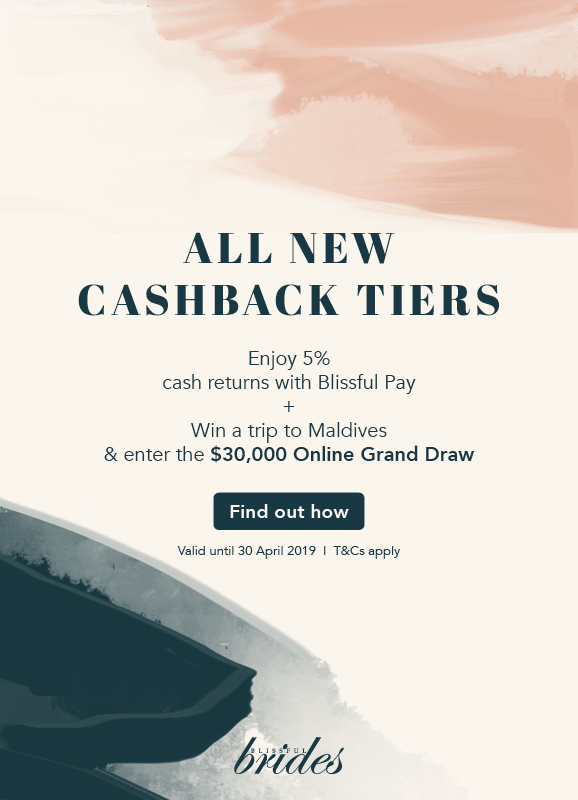 The Splendour theme that we opted for was a classy one with primarily whitish tones. After including some pink and champagne hues for the décor flowers, we were very pleased with the outcome as the colours matched perfectly with our reception area décor, DIY solemnisation décor, and bridal bouquet, all of which were completed by different vendors. Ben: Last but not the least, Mandarin Oriental had a commendable team that assisted us greatly. Everyone, from our main wedding coordinator, Lynette, who was very helpful, approachable, and prompt in replies, to our banquet manager, Raymand, who ensured that the banquet progressed smoothly and that our specific requests regarding the programme flow, sound and lighting were executed well, to the dedicated butler Niko, who was assigned to Celine, to help her with her wedding dress amongst other things. 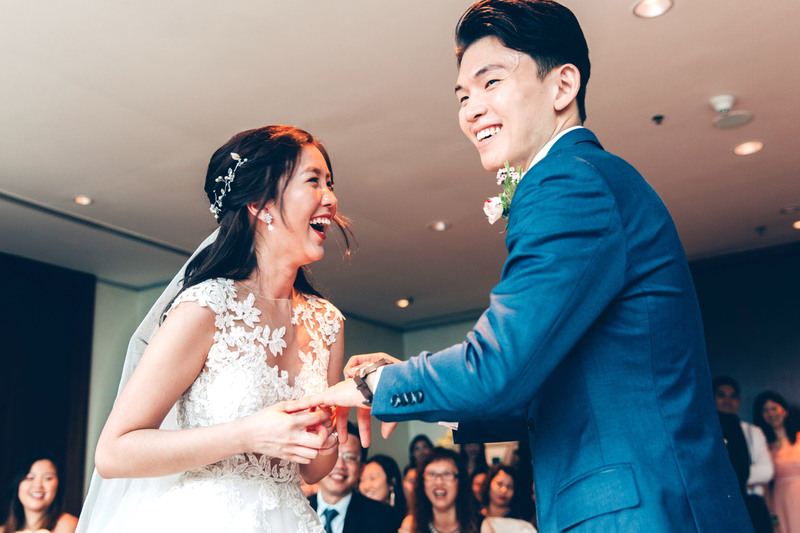 Celine: Our pre-wedding shoot in Korea was a one-of-a-kind experience as we truly felt like celebrities for the day! We actually did an indoor photoshoot in Korea which invited a lot of “why do you need to go all the way to Korea for an indoor shoot?” questions. One of the main reasons was to experience the top-notch makeup and hairstyling services at the Korean celebrity salons. 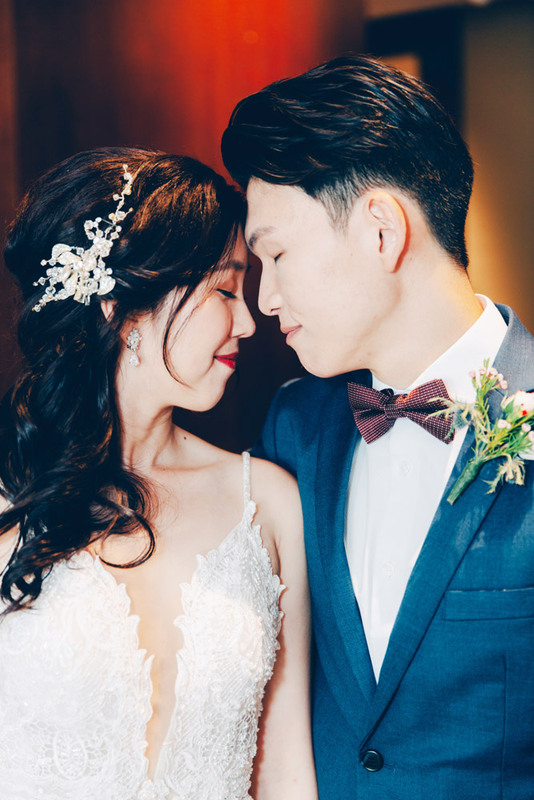 Another special feature of Korean pre- wedding shoots is the professional bridal assistant that would help the couple (mainly the bride) with outfit changes, changing of hairstyles and accessories, touching up of make-up etc. during the shoot. All we needed to do was to pose according to very clear instructions by our professional photographer. We were very pleased with the overall experience and received many compliments from family and friends on the pretty styling and photos. Ben: One of the most memorable moments took place during the solemnisation ceremony. When Celine was putting on the ring for me, the ring was stuck for a good thirty seconds due to my larger knuckles. The situation was amusing for everyone, including us. Thankfully, she upheld the never- give-up spirit and managed to slip the ring on eventually. Some of my family and friends then told us that it was better for the ring to be tight, to symbolise a more secure marriage. Another memorable moment was when we sang our self-composed song on stage, with my talented younger brother as the guitar accompaniment. Since we were brought together by music, we thought it was meaningful to write a song to commemorate our special day. The song title “ 不LEE 不CHEE”” was a pun using our surnames, which rhymes with the Chinese idiom “不离不弃” which means to never let go of the other. We kept this segment a secret all the way until the big day and performed the song for the first time in front of all our family and friends. It was a touching moment for us as the lyrics also tells our love story. Please Sign in before leave your comments.